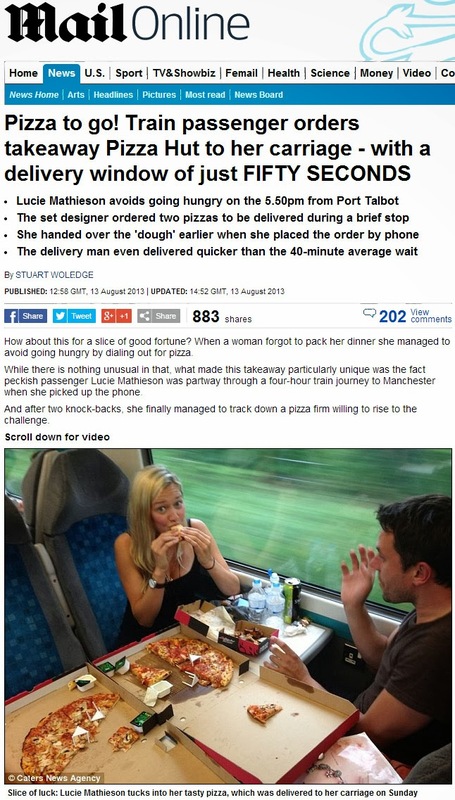 It would be interesting to see if anyone will try this on a GO train and if any pizza company will play along. Her trip was four hours and she was hungry. It's amazing what people will do when they are hungry. Now I want pizza ... seems much more appetizing than the lunch I brought with me. Be careful what you wish for. If some of your fellow passengers get a hold of this idea and get a pizzeria on board (er...in kahoots) you will have to update your "Get to know your TCT donkeys". Just watch the garbage strewn around the cars if this ever happened. I for one wouldn't enjoy walking around pizza crusts, soggy boxes and cans/bottles of drinks casually thrown around by the GO donkeys. Genius. Brilliant idea - they knew 1) they were going to be on a long ride and 2) what to do to find what they needed.